Two mountain bikes each with two panniers loaded with provisions and sleeping gear. 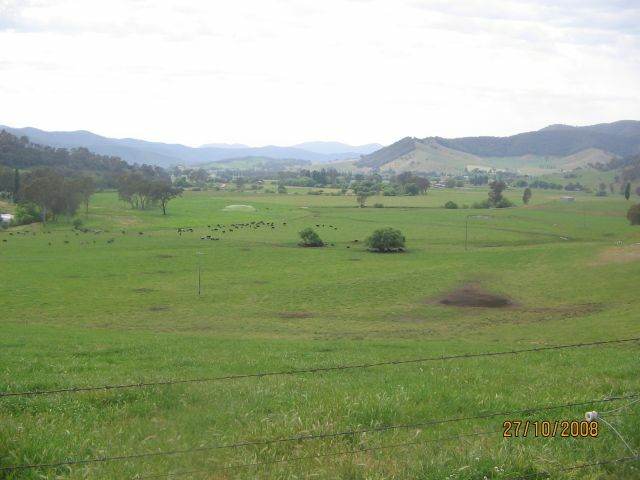 Rugged country around Anglers Rest and the beautiful green Mitta Mitta valley. Steep climb on Omeo Highway about 20km from Anglers Rest. 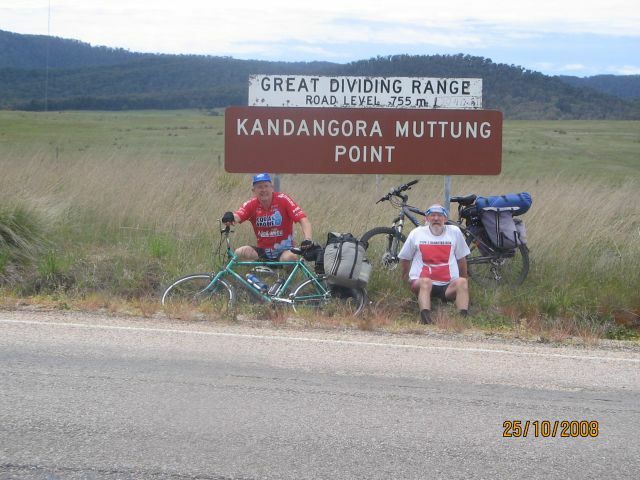 The last 60km through Tallangatta and into Wodonga we rode into a headwind. Not very pleasant. Omeo Highway about 30km from Mitta Mitta. Downhill for about 15km on a made road. Riding alongside the Mitta Mitta river we encountered numerous thick clouds of small black insects a bit like thrip. Sunscreen on arms and legs caused them to stick there. Biggest problem was they got in your eyes and mouth. Twice, each about 300m. If you get tired, it is probably a good idea to walk and push your bike for a while. Up a steep hill the speed difference is not much. Everyone wants to talk to you when you are on bikes loaded with all your gear. Met some interesting people. Glen Wills which is about 20km from Omeo. See this photo. A bit of surprise seeing it in excellent condition. Discovered later that a firm of bridge builders were constructing a new bridge over the Mitta Mitta river at Glen Valley. The mother of the bridge builders (of Italian descent), was visiting her sons and was amazed that there were no crosses in the Cemetery. Before leaving the area, they built a large cross on a square slab and promised that one day they would come back and erect crosses to commemorate the grave sites. This they did in the summer of 1991. As there is no plan of the actual sites of the graves, they were placed in a double row consistent with the two graves visible. Mitta Mitta camping ground. We placed our tent near the newly erected camp kitchen. Covered tables and cooking facilities. Very nice. However, in the shower block, the clothes dryer would not work and the showers and toilets were a bit grotty but it was great to have a shower after 3 days riding. Rail trail from Tallangatta to Wodonga has a rocky surface and difficult to ride on. Also, signs indicated the trail could be traversed across Sandy Creek where there was once a rail bridge over the creek. However, it was poorly signposted, very rough and we had to lift our bikes and gear across an electric fence. Not worth the effort. Eventually, we gave up and took the road. About 1200m on the Omeo Highway. Swifts Creek bakery. Fruit pie and cappuccino. See this photo. Chinese restaurant in Wodonga. Very dirty. Had to ask for toilet paper and there was no hand towel for drying hands. About 20km out of Anglers Rest you pass over the Mitta Mitta river but it appears to be flowing the wrong way. Discovered later that it sources near Mt Hotham and flows SE for a while then swings around and flows North towards the Murray. A guy on the train to Bairnsdale suggested we have dinner in the Ensay hotel but we could not find it. Found the Ensay South hotel which has been converted to a gallery. 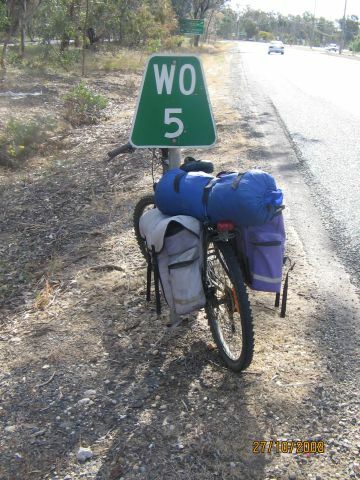 Seeing the 5km sign to Wodonga. See this photo. On the Omeo Highway. Only three vehicles passed us. The proprietor of the Hotel at Anglers Rest told us about the 2003 bushfires where the CFA abandoned them and he and his brother were left to save whatever they could. The fire swept over them at 100km/hr and all their vehicles and some outbuildings were burnt but they saved the original hotel buildings. A terrifying experience. The proprietor of the Mitta Mitta store told us about the 2006 bushfires where the CFA was initially told to save the historic hotel in the main street and ignore everything else. He explained to them that he had 20,000 litres of fuel stored in tanks and if his building caught fire and the fuel went up the whole town would be blown up. They went away for a while and must have spoken with a higher authority because they came back and had decided to protect his building. As it turned out the fires did not descend on the Mitta Mitta township but got very close. 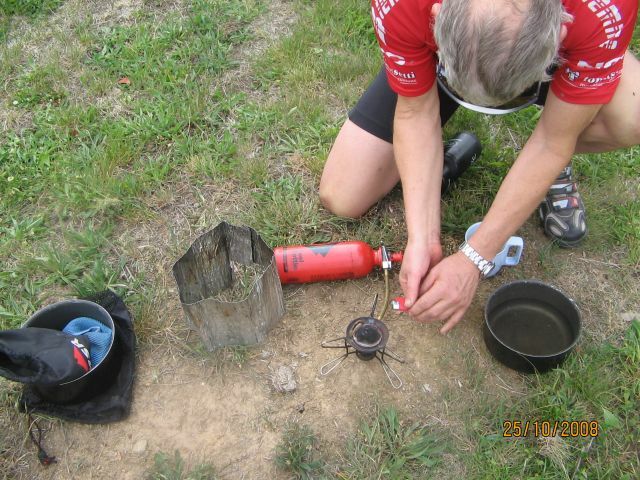 Noel had flat tyre near Tallangatta on the bike trail. What drivers tell you about the steepness of the roads ahead. Whenever we stopped and spoke with locals we asked about any steep ascents ahead but the information was always wrong. It seems that when you are in a car you have no concept of the steepness of the roads. Noel’s fuel stove. Boiled water very quickly. See this photo. At how high up Omeo is. About 700m. Rick - 12 to 13km/hr. Noel - 15km/hr. Low 20's every day. No rain. Ridden 110km on the last day. It was too far, particularly as we struck a head wind for the last 60km.